Appliances are convenient time and labor saving devices that American society has come to depend on. Just as appliances are made from steel, they reduce our worries about disposing of them after they no longer work. 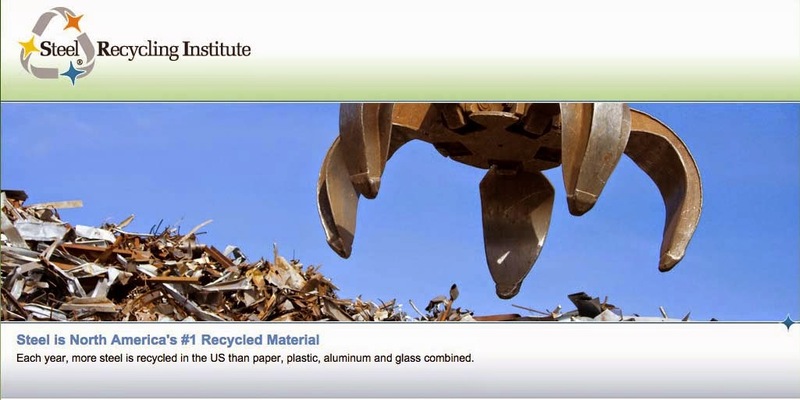 Steel is North America’s #1 recycled material. More than 66.8 million tons of steel scrap were recycled from steel products, such as appliances. In only five years, the national recycling rate for hoe appliances has risen from 32 percent to 74.8 percent in 1995, with more than 41 million appliances recycled in 1995.
to recycle steel to even greater levels. The steel industry’s steady, increasing demand for steel scrap has notable consequences. First, the United States has developed the most efficient steel recycling infrastructure in the world. More than 1,600 ferrous scrap processors prepare steel scrap for recycling by the steel industry. Like any other raw material, steel scrap has true economic value. As a result, steel scrap is collected and prepared for recycling from a variety of sources for its market value as well as for the energy savings and natural resource conservation it provides to the steel industry. Appliances are easy to recycle because they contain large amounts of steel. By weight, the typical appliance contains about 75 percent steel. And according to the Appliance Recycling Information Center, Washington D.C., the average steel content in refrigerators, clothes dryers and ranges all exceed 100 lbs. Many communities have established temporary or permanent collection programs to ensure that appliances are recycled. These appliances are accepted by ferrous scrap processors who prepare them for recycling by the steel industry. Processors typically remove components, such as electric motors, capacitors, switches and other mechanical parts, from the appliances before recycling. If the appliances contains refrigeration or cooling equipment, refrigerant gases must be captured and recycled. CFCs and hydro chlorofluorocarbons (HCFCs), both considered ozone-depleting coolants, are only found in appliances that refrigerate or cool. The CFCs and HCFCs that are reclaimed are cleaned and reused in the maintenance and repair of other units. In some areas, scrap dealers have the CFC removal equipment and certified technicians to easily accomplish these procedures. In other areas, specialty recycling companies provide this service, either independently or in association with appliance dealers or the local government. In either case, processors involved in recycling appliances are responsible for ensuring that the refrigerants have been reclaimed. Ferrous scrap processors accept all types of steel scrap, including appliances, for recycling. At the scrap yard, the automobile shredder is the primary equipment for preparing appliances for recycling. Shredding an appliance breaks it down into small chunks of steel, which are melted more efficiently for recycling in a steel mill’s furnace. It also facilitates removal of nonferrous metallic and nonmetallic fluff. Appliances are fed to the shredder by crane, which loads the appliance onto a steel conveyor belt. What looks like a spiked, over-sized dough-roller crushes the appliance down and rips the shell apart as it enters. Inside, free-swinging hammers shred the shell into fist-sized chunks. The material then exits the shredding unit and continues down a conveyor belt for mechanical sorting. The steel components are first magnetically separated and eventually discharged from the conveyor to form large piles of shredded steel, plus a smaller component of nonferrous metal, and a pile of fluff which is ultimately discarded. The two types of steelmaking furnaces, the basic oxygen furnace and the electric arc furnace, use steel scrap to make new steel. Integrated steel mills use the blast furnace to process iron ore into molten iron. Then the basic oxygen furnace uses scrap steel and oxygen together with molten iron to make new steel. The final product from the basic oxygen furnace contains approximately 28 percent steel scrap, or in today’s environmental terminology, recycled content. Another steelmaking process which uses steel scrap from appliances and other steel products is the electric arc furnace, which uses virtually 100 percent steel scrap. The 1995 appliance recycling rate is 74.8 percent, up from an estimated 20 percent in 1988. This recycling rate should continue to expand, as 18 states have passed legislation banning appliances from landfills to extend the life of their landfills and to encourage the development of new recycling programs.